I'm very excited about Francesca Lowe's forthcoming Headland: Woman in a Landscape exhibition which will be opening at London's Riflemaker this coming Monday. With an oeuvre that brings together the abundance of Julie Heffernan, the hybridity of Heidi Taillefer and the menagerie of Josh Keyes and paints it all in a dystopian watercoloury sweetness and on a huge scale, Francesca Lowe surely knows how to aesthetically amalgamate and wow. “Elle en avait fini, songeait-elle, avec toutes les trahisons, les bassesses et les innombrables convoitises qui la torturaient. Julie Heffernan at Catharine Clark Gallery, S.F. 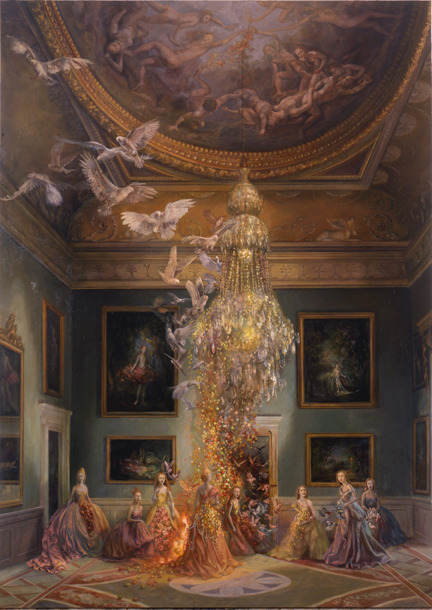 My imaginary Siamese blog twin sister Phantasmaphile kindly informs us about an upcoming Julie Heffernan exhibition entitled Broken Homes which is due to open at Catharine Clark Gallery tonight. There's not much information available on the gallery website yet, so please make sure to check back later. Having just exhibited Timothy Cummings' Last Call, it seems to me that Catharina Clark follows a rather aesthetically consistent exhibition programme which of course is very much to my liking. Sadly, I've never actually seen any of Julie's works in person, but I've been told that her detailing is vertiginous if not hypnotising. As an ardent lover of her narrative self-portraits filled with an overwhelming abundance of fragant flowers, exotic birds, consuming fires and distorted mirrors, I must admit that I'm visually not too keen (yet) on her new Brueghelesque organo houses as motives, but they're beyond doubt masterfully executed and the fact that she still refers to them as "self-portraits" definitely fills them with endless layers of meaning and purpose. And I like purpose. I) Alex has a beautiful Alice print box set for sale! It's an adorable hand signed and numbered A5 box containing 15 of his sickly sweet What Alice Saw drawings. They're printed on heavy weight drawing paper and I think you should all have one. Or two. II) Another thing everyone should have is a printable and customisable Christopher Walken mask! How could I ever live without one?! "Elle en avait fini, songeait-elle, avec toutes les trahisons, les bassesses et les innombrables convoitises qui la torturaient. Elle ne haÃ¯ssait personne, maintenant; une confusion de crÃ©puscule s'abattait en sa pensÃ©e, et de tous les bruits de la terre Emma n'entendait plus que l'intermittente lamentation de ce pauvre cœur, douce et indistincte, comme le dernier Ã©cho d'une symphonie qui s'Ã©loigne."